There is tremendous demand for mattresses, pillows and upholstered furniture that contain certified foam. People care about the products they bring into their homes. Before the inception of the CertiPUR-US® foam certification program, consumers looking for the comfort of knowing what’s inside the foam in their mattress and upholstered furniture -- or rather, what isn’t -- had no compass to guide them in the shopping process. The CertiPUR-US program has demystified a critical aspect of shopping for mattresses, mattress toppers, pillows and upholstered furniture, which typically contain conventional or viscoelastic (memory) flexible polyurethane foam for cushioning. CertiPUR-US-certified foams meet standards for content, emissions and durability, and are analyzed by independent, accredited laboratories. 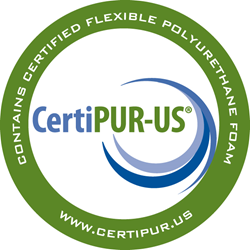 The CertiPUR-US foam certification program, administered by a nonprofit organization, was established in 2008 to combat substandard foams imported from other countries. In some cases, these substandard foams contained substances that had been banned in the U.S. or were listed by chemical watch groups as potentially being harmful. A group of foam manufacturers, in conjunction with environmentalists, academics, chemists, and industry and consumer groups developed a testing, analysis, and certification program specifically for these uses of flexible polyurethane foam. The program updates its Technical Guidelines and testing requirements periodically to reflect the latest science and new health, environmental, and safety regulations. A directory of companies and brands offering bedding and upholstered furniture containing certified foam is available at http://www.certipur.us.